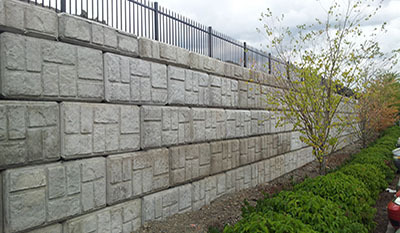 For over 25 years Ultrablock has been recognized for providing a sustainable solution to customers retaining wall needs. Standard concrete blocks are produced utilizing surplus or recycled concrete to provide environmental and economic benefits. Specific concrete mix designs can also be used in manufacturing precast blocks. 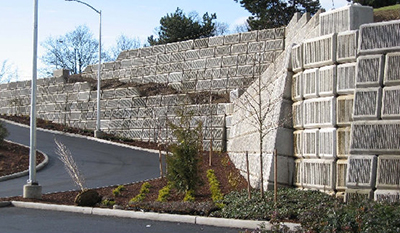 Ultrablock is used for a continuously growing variety of applications that goes beyond standard retaining walls. Whether your project requires a material bin, a 25-foot tall gravity wall, a 50-foot tall reinforced wall, an impact barrier or blast shield, look to Ultrablock for the right solution. Gravity walls are designed on mass and weight of materials in the wall. Gravity walls require no tiebacks and are usually applicable in a "cut slope" situation. Ultrablock offers gravity wall blocks with lifting loops for easy installation. MSE Walls, or tieback walls, are best used in "fill" slope situations. They are built with a combination of blocks and geogrid tiebacks. Ultrablock units are an excellent replacement for small block walls as an installer is able to place 12 square feet of face at a time. 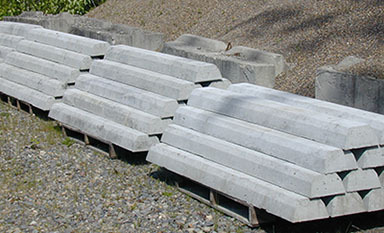 Ultrablock provides protective concrete barriers to prevent access to prohibited areas, and to define perimeters to protect from vehicular encroachment. Ultrablock wheel stops and jersey barriers are precasted allowing a uniform shape and size.